Did you remember that feeling. That one waking up on a Saturday morning and running to find the paper, maybe tearing apart the sports and classifieds looking for two special things? You know what I'm talking about. The comics and The Mini Page? The best thing about of that paper was it was full of fun that any kid (especially me, cause I'm a dork) could fill a morning or afternoon with. The Mini Page was a single newspaper insert in the standard newspaper for kids that came in the Saturday paper. And it was the BEST THING EVER!! Okay, it was educational, and in the same realm as the Weekly Reader that I and (millions of kids in the 80's and 90's) got at school. Note: Is Weekly Reader a thing in school anymore? Not having kids I just don't know. A newsletter of sorts about science, literature, news, and such. The Weekly Reader was something that we, as kids, had to take home and read, and then do the puzzles and trivia questions. Now that's homework! The Mini Page featured a topic and had small, kid friendly, articles about the topic. 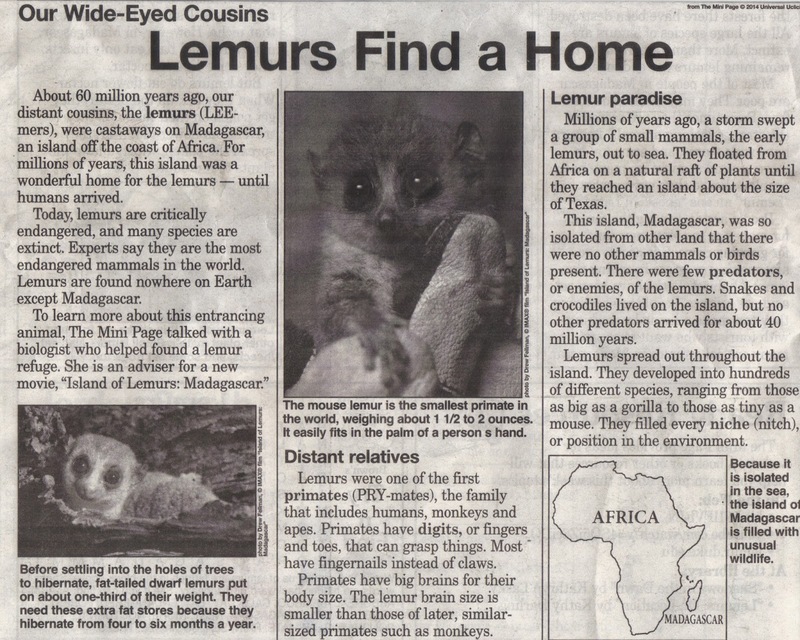 This week's (well, last week's) is all about lemurs. Printed on newsprint and with pictures that didn't always look the clearest in black and white, but was still awesome, but I would sit somewhere, usually on my stomach and read about Lemurs, Arbor Day, Cinco de Mayo, or [insert topic here], and then proceed to finish the puzzles and read the stupid jokes. It was the best! My favourite parts were the Mini Spy and the Mighty Funny's jokes. I seem to remember there were more than the word search and try to find puzzles. The Alpha Betty and the Alpha Mice for example, their purpose I am still fuzzy on. 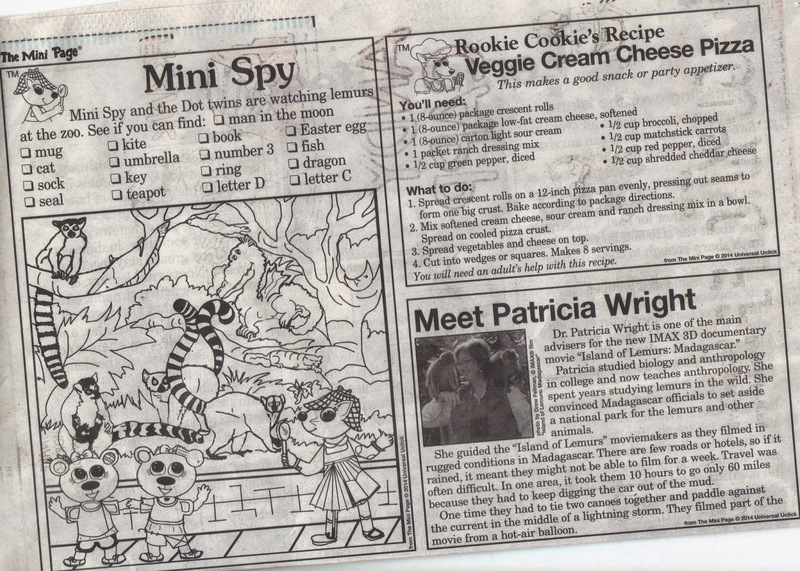 But there was Gus Goodsport's feature on an athlete of the week, Rookie Cookie's recipes for kid cooking (with parental help), a Meet this Person Spotlight (usually someone who is involved in the topic being presented, connect the dots, mazes, and still other segments. I do believe that over the years some of the segments have changed and been switched out, like the connected the dots and the mazes (i remembered this while digging around on the internet. Each segment had a mascot; Rookie the Kangaroo, mighty Funny the Superhero, Mini Spy the Cat (? ), Bassett Brown the News Hound, Alpha Betty, Alpha Mice, and the Dot Twins (bears). I think that was what made it easily connectable for me, having the characters that introduce the segments. Plus I was always fond of anthropomorphic animals, even at an early age. Did you know that The Mini Page has existed since 1969? And it's still running to this day, 45 years later? 45 years! Wow, imagine all the the kids that were inspired and educated by The Mini Page (that's a lot of kids) and founding editor, Betty Debnam. She who was the first editor, writer, researcher, and layout person! She was an elementary school teacher and not originally an artist, but created i a successful learning tools for children. Those critter and kid characters are classics now! I bet you didn't realize that The Mini Page was inspired by the Weekly Reader. Also, The Weekly Reader has been around since 1928 and ran until 2012! They were all inclusive "newspapers" that featured articles on science, crafts, literacy, politics, history, vocabulary, etc. Weekly Reader was eventually bought out and absorbed by Scholastic in 2012 and while the Reader doesn't exist in the classic format there the Scholastic News magazines that are still being printed to this day. It was an easier time when all you had to worry about was reading the Weekly Reader and answering the questions and puzzles. I think the Reader was used mostly from third to sixth grade, featured in schools, as that was the original aim, to use as a supplemental tool for teachers. Originally call My Weekly Reader in the early days and later just Weekly Reader. How many of you, Dear Readers remember The Mini Page and the Weekly Reader? Favourite memory? Anything you hated about it? Leave me a comment below. It's been such a sunny and warm day here. I have been so very productive. I hope your weekend is going as well, Dear Readers. I will leave you with a quote from the late Dr. Maya Angelou, “Try to be a rainbow in someone's cloud.” Also,I have been reading, "Catching Fire", so, "May the odds be ever in your favour..." And some "Victory" Bond for you too!! I have not been as productive as I had hoped this week. Things caught up with me and being out of town other stuff was pushed aside. I am still suffering with the horrible cough, left over from the tonsillitis. I have been busy with Improv, Tarzan, and getting time to write in sync with the rest of my schedule. I always feel bad when I do less than what I planned to do. But, that is what A Round of Words is about. It about finding a balance, writing, and knowing that sometimes life happens. I was still quite productive though, Here's what I have accomplished this week. *I visited 6 or 7 blogs. While I didn't comment on any, I did fully read each entry. I want to continue to visit at least 5 to 10 blogs and comment on said blogs. *Second successful Improv Show on Tuesday. Made a little money for The Lake Country Players and have a few new and interested people wanting to try improv. I feel like I am finally getting the hang of this improv thing. *Continued to journal twice a week. *Have read further into "Catching Fire". I;m a a lull, but I think it's because it's the second book. I always seems to have trouble about half way though a series. Well continue to make my way thorough it. I loved "Hunger Games", but I am not sure if I am a uber fan. It's a good story, but ask me again when I finish the series. *Blog at least once that is not a ROW80 entry. This is the BIG thing! I miss blogging about stuff and things. Will push forward on this. *Write something everyday and post and excerpt on Sunday check-in! (Dear Readers, I need your help, please help me to be held accountable). *Comment on at least 5 blogs in the next 7 days. 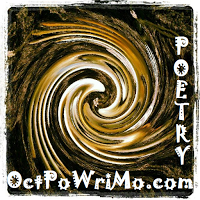 *Find and submit poetry to more online journal (those directly connected to NaPoWriMo and others). At least 2. So, while I am beating out my new goals for the week, I am scanning through the journals featured during NaPoWriMo. I am excited because I have run into a couple of journals that accept Poetry and Fiction. This is exciting. I do have some stories ready for submission now and poetry too. I have 7 journals to submit work to now and I am only at Day 19 (working backgrounds here). That's a good start. Ending this check-in on an extremely positive note. Dear Readers, have a great rest of the week. I am going to be busy, but that's not a surprise is it? See you around the interwebs. Remember to visit the Blog Hop of my fellow bloggers/writers. Also, I have just decided to blog about the "Mini Page" in my next non-ROW80 blog. A blast from my past that is still being printed today. Have a fantastic week,Dear Readers. I believe in you! Lucy believes in my shoulder! It's Memorial Day weekend, and I have taken it off! I am out if town visiting my dad. It's been a weekend of reminiscing and relaxing. 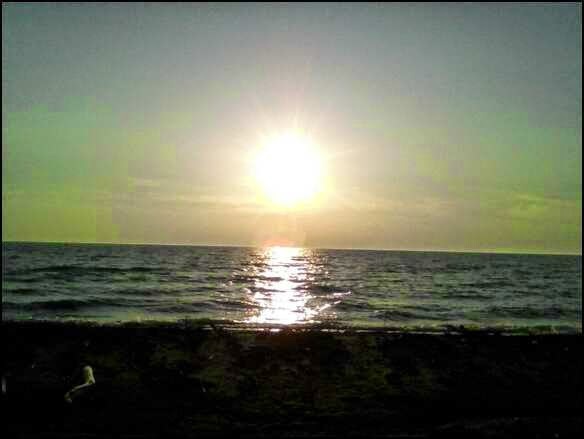 I got to stand on the shores of Lake Erie at Point Grommit (Officially Point Gratiot), see a white squirrel, and have a peanut butter banana milkshake and Sullivan's Charbroil. I do some of my best thinking when standing on the beach. Point Grommit is one of those places where all you see is water when you look out at the lake. The sunshine glinting off the water with the breeze blowing steadily. It's a calm place. It's one I return to most times I return to Chautauqua County. I wrote a scene about standing upon these shores. It just a great place to get inspired and also find beach glass, even though the beaches are still littered with dead fish, drift wood, and and winter trash. Despite the grubby attire, Grommit was a beautiful site. David and I played upon the shores ans took pictures. It was grand fun. This is really what we do when not glued to our computers. We have photos of White, Black, and Black and Red squirrels that will share next time. Upon the less than happy news from Chautauqua County. This news has been going around the internet block, but I thought I would comment on it since I was going to be in Fredonia this weekend. It's a harder trip to bear with the local factory that makes ketchup, salad dressing, and peanut butter; Carriage House (formerly Red Wing) having been bought out by ConAgra Foods. They are planning to shut the factory down sometime next year and the feel of my friends still in the area is anger, frustration, and sometimes defeat. I have friends that are planning on moving to Missouri after Carriage House closes. I can feel the change in Chautauqua County. While there is fights still going on the try to keep the factory open, there are those who are choosing to leave the area. It's a rough world we live in. I can on;y wish my friends who choose to to leave the very best of luck and continue to make my life the best. It's a personal choice and in a world full of crazy corporations and bad news, sometimes you gotta make the tough choices and make yourself happy. 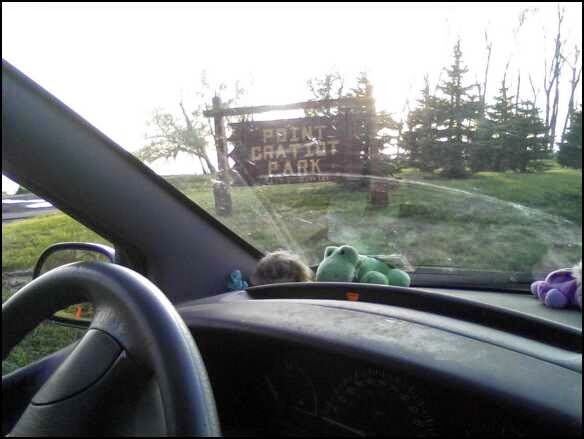 So, for me, I go to my happy places, Point Grommit, Russell Joy Park, and Sheridan Memorial Park. These are some of the happiest places of my youth. I have reclaimed my happy and currently watch Star Trek Into Darkness and blogging contently. It's true that I have not done any goals since Friday, but I still feel good. I am starting fresh tomorrow, Dear Readers. I hope you all have an awesome Memorial Day, whether it is a picnic or just spending time with your family. What are your plans? 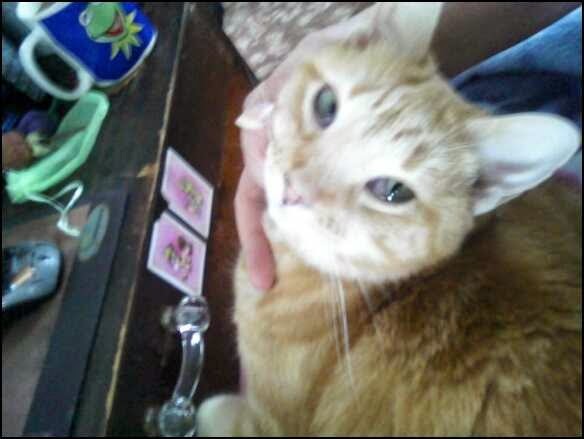 I am returning to Corning and spending time with the kitties. I might grill up some burgers and maybe watch a bad movie or two. Have a great Memorial Day, Dear Readers. I would love to share my scene that I wrote earlier in the week, inspired by Point Grommit, or at least part of it. Let me know what you think? Also,l go and visit the other ROW80-ers at the Blog Hop!! I remember that afternoon, when the sky was a slate grey. There were clouds, looking like cotton balls coated in grey paint and nary a sight of blue. I was sad. It was colder, much colder than a May day should be. My canvas shoes sunk into the sand and I can smell seaweed and rotting fish. The shale rocks abounded, and there in my hand, I cup a good sized rock. The edges feel sharp, but I am not really paying attention. I can feel the air wash over my arm as I fling the piece of shale into the lake. "Damn, I was hoping for a three bagger," I said to the passing seagulls over head. Their calls echoed across the waves and the wind. I look down to find another piece of shale. There are pieces of green and blue beach glass sitting upon the sand like jewels. My hands scoop up a handful of wet sand as I pull out the finely worn glass pieces, and dust off the sand. It clings to my hand and I left patting my hands on my pants. I glance up at the sky and the lake. The breeze has picked up. I came here to think. It always was that way. Another handful of sand and another green piece of beach glass, into my pocket. I lean over to grab a piece of shale, determined to skip this stone at least three times. My dad could skip three or four, sometimes even five. Pulling back I let go. "Should have known," I said to the lake. 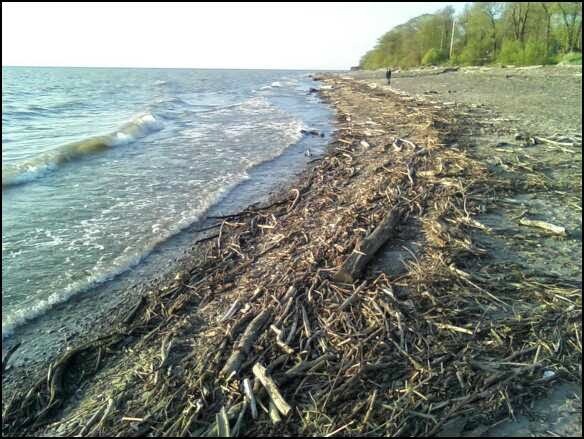 I started walking along the shores of Lake Erie. Looking down there's piles of seaweed, driftwood, and occasional dead fish. Standard. 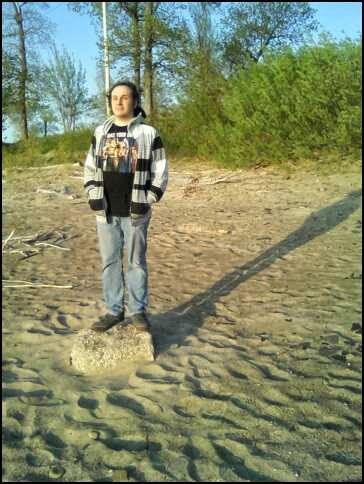 I picked up a rock and lobbed it into the lake. I was thinking about her again. I looked down and found another piece of shale; it was in my hands and flying across the air. I saw her face, there next to me, also skipping stones with hair blowing around and laughing. I loved her. Not just in that moment, but always. I turned to her and kissed her on the lips. The kiss. The kiss that never happened. At least it never happened here, in this moment. I felt my lips, my tongue and the warmth flowing down throughout my body. The real world came back. I was cold and shivering and feeling very alone. 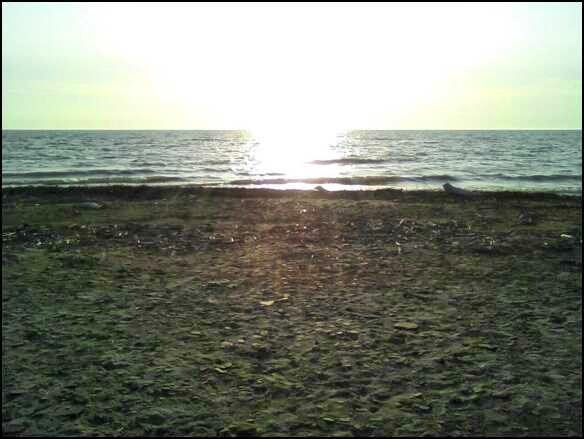 I stared out into the expansive void of Lake Erie, steel blue and slate grey in the sky. This place was special. Not just because I came here with her, but because it was a beautiful place to lose you mind in the water and waves. So today, I started my day with Tonsillitis. Yup. I haven;t had tonsillitis since I was much younger than I am now. But this would explain the tiredness I have been experiencing, that no amount of sleep seems to fix, that and the feeling I swallowed a couple of cotton balls. I remember getting sick a lot growing up and having swollen glands A LOT. I wondered why they never took out my tonsils if I was always getting sick. Makes one wish they could just go and get their tonsils out, but I don't really have the extra money, even with insurance for something like that. The good thing about this is that drinking slushies/icees/slurpees are great medical therapy. It's kind of funny, because the main joke of "Zombeo and Juliet" was that Zombies and Zombie Hunters loved drinking slushies. Funny! Now, I have 5 days Z-Pac therapy and resting at home. The day job involves talking on the phone and with my voice feeling as cruddy as it has been since Monday, I had to take the day off. Been drinking lots of fluids both hot and cold and watching Buffy the Vampire Slayer on Netflix. But, now's the time to get to work. This week I have been writing, not anything specific, but just writing. I stockpiled a bunch of writing prompts from ealier in the year. I want to at least writing as close to every day, either on WIP or on free thought writing exercises. I thought this would be a good way to get me to write consistently, especially when not writing for things like NaNoWriMo. I have a page and a half about a moment that some friends told me about. Cow wrangling her step-father's loose cows. Maybe I can get a story out of it. Or not, but the imagery from her story about wrangling these cows in the middle of the night was one I could not pass up. Also, I have submitted another set of poems to an online journal. That makes two submissions in less than a week. Granted, I won't know the outcome for a few weeks, but it's quite exciting. It's very similar to auditioning for a play/musical. The hurry up and wait syndrome! Check out Work to a Calm and CSHS. Tarzan has started up, so my duties as the Producer has begun. A lot of it is being present and collect receipts and forms and monies, but I also get to watch a show come together, take pictures for record, and help out in anyway I can. But, not much else going on. It been quiet lately. The second of the improv shows on the 2014 season goes up next week, but that's cake. 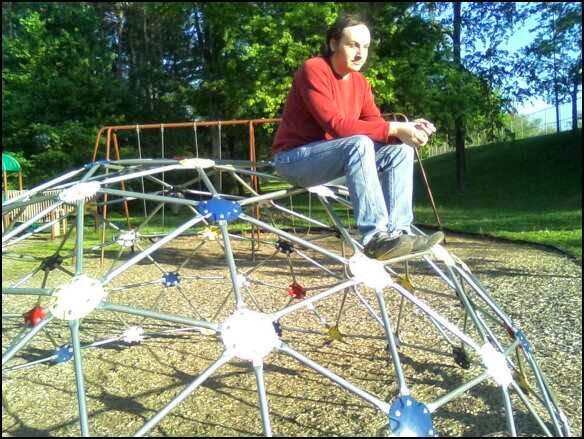 Improv rehearsal tomorrow and then Memorial Day Weekend in Fredonia. I am glad that it's been a slower week, being sick doesn't help, but having the time to rest and re-coup has helped. I know what goals I want to work on next. I want to write regular blogs again; to find something to research and/or comment on. I miss that. Prior to starting A Round of Words, I blogged a lot more about specifics. I need to return to that. I have a list, should revisit that. I will continue writing and reading, and being a theatre nerd! Dear Readers, have a blessed week, and a fantastic Memorial Day Weekend. 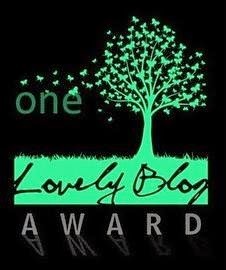 Check out my fellow bloggers/writers at the Blog Hop. What is your favourite warm weather, summertime activity? Mine, Dear Readers is being out in the sunshine, whether reading on a blanket on the lawn, under a tree, hiking, going to the beach, or just going to a walk, anything in the sunshine is my favourite. Have a sunshine haiku! World, that is the now. I am very proud of me this week. I finished up a week with some of the best youth actors in Schuyler Country (and surrounding areas) with "Zombeo and Juliet". So proud of those kids!Today was the first day of my time as Producer for KLP's production of "Tarzan" with another awesome cast. Not even off the high of Zombeo and onto the next. Although it is weird NOT being onstage for Tarzan. That just me, I LOVE me onstage time. *I wrote 961 words. In just opened up a document and started typing. It felt good to just write. Not sure if it'll will be part of any of my WIP's, but I like the scene I created. Quite emotional. A little reminiscent. But lovely anyway. *I wrote a writer bio and a cover letter (have since revised the bio, still working on the cover letter). A bit of out of practice writing cover letter, and usually for job applications, not writing submissions. And thus submitted my first poetry submission in 10 years, maybe not that long. It's been a while, regardless. Working on getting a second submission send out by close of day today. *Continuing to push through "Catching Fire", with the theatre projects, I haven't read as much. Things are starting to pick up now that Zombeo is over. I also have a new recommendations; the Oryx and Crake series. I had read the first (?) 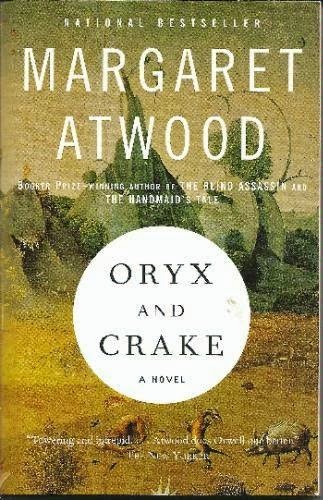 book "Oryx and Crake" but didn't know there were two other books in the series. *Housework is mostly caught up on. There are a few dishes to wash, but the laundry, litter, lawn, and trash is done. Loving the new washer and dryer. DRY CLOTHES ARE AWESOME!! And the cold drinks in the new fridge. I feel so grown up buying new appliances. I also feel excited. Is that weird? That's it really, Dear Readers. It might not feel like a lot, but after a tech week, it's a major improvement. I feel so productive. I hope to have even more to report on Wednesday. Also, the goals for the week include visiting at least 5 to 10 blogs and commenting on them, write at least 500 words (either on a WIP or just because), and pick up my 2011 novel "Tale of Memories" and work on that revision (at least 1 chapter). This months improv show is fast approaching, so I have 2 rehearsal before that show and now Tarzan keeping me busy. Oh, well! NO rest for the Weary, Wicked, or Theatrically Bonkers!! That's me!!! I honestly wouldn't change it. This is me and it's what I do. Have a GREAT WEEK, Dear Readers!! Remember to visit me peers over at the Blog Hop!! 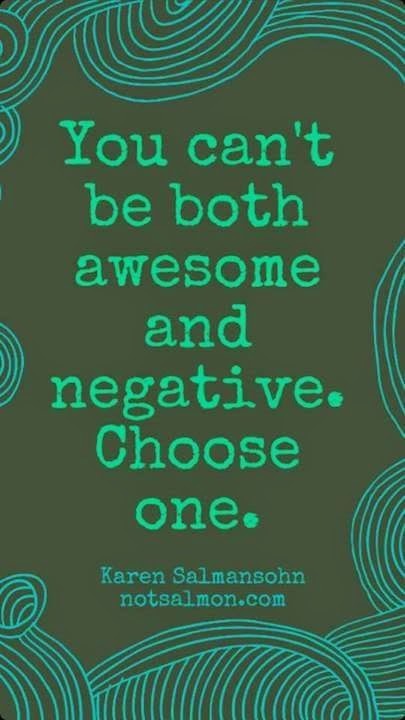 Be good to each other and be AWESOME. See the sign to the right. It speaks truth!! Tech Week Check-in and Reflections! Tech week is always a blur. The days run into each other, whether on or back stage. I wake up in the morning, go to work, and then off to rehearsal. This show I am running crew. I move the sets, get the actors in position, and play theatre games with kids, very talented kids. I'm listening the the Audio Book version, "Drawing Out the Dragons" by James A. Owen while writing this blog update, my ROW80 check-in and I am thinking, am I the type of who makes things happen, or the type of person to things happen to? Words from my mentor and friend James. I want to write. I want to make words that others can enjoy. So, what does this mean? Means that I need to write. Means I need to submit writing (stories, prose, poetry, scripts). But, I also do theatre; act, direct, sets, props, and now produce. I need to spend more time writing, even when I am doing a show. I NEED to write. What I decide today is that I will write. I have had a rough and busy year so far, but I managed to do 2 blog challenges, act in a Shakespeare show, and started Camp NaNo. I wrote a lot of stuff in the month of April. I my not have written a specific story, as I did earlier in the year. What I did do is prove that I could do it. And I also realized that I miss writing regular blogs entries and stories. I want to return to that. I WILL return to it. I am still planning on submitting some poetry by week's end. And I have some ideas for stories. And an awesome thing, even though I do not make it to completion of Camp NaNo. I did make 18,000 words (give or take). That's not bad! I also realized that I have the beginning of a novel. Also, while listening to James' words that I have my desire, my passions, but I and in a course correction. This is NOT a bad thing, but it is a thing. I know what I want and I will get there. I can change my sails, hoist the mainsail, and all those nifty nautical terms. I can steer my ship towards the winds and sail onto the next great adventure. So, I am going to change me format. 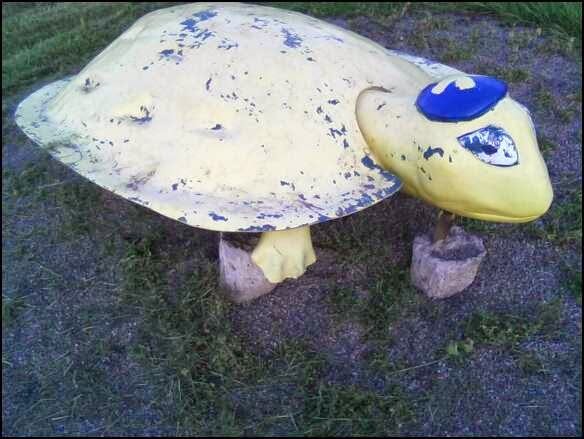 I like what some of my fellow writers do with their updates. Bullet points! I have used bullet points before, but didn't want to seem simplistic. But, after consideration the strong desire to go back to them is apparent. I think this will help organize my writing and my goals. Might even show more progress. Get back to work, Human! *Read a bit more of "Catching Fire" (trying to read at lunch (at least). *Pulled poems for a couple of online journals submissions. *Write a cover letter and bio and submit the said poems. *Work on one of my WIP pieces, at least 250 words. *Write 1000 words on something, whether story, prose, or script. *Work on one revision (even if it is one chapter or story). 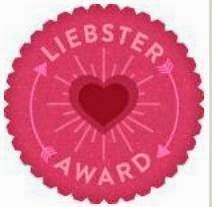 *Continue to view fellow blogger/writers. Maybe 5 per week at least. *Post a non ROW80 check-in blog. My original intent! Dear Readers, to say that this week hasn't been full of stuff is a preposterous. Quite full, with work being busy (working in the construction field, I now understand) and tech week for Zombeo every night this week, but tonight is the first night that I know what my next step is with the writing and where I want to take it. It's a course correction, not a failure. Like I opened my eyes to see what was already in front of me, but I somehow missed seeing it. Don't worry, I got this!! Oh, spread the good karma and visit some of my fellows at the ROW80 Blog Hop. 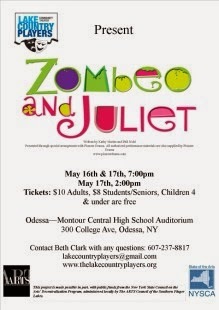 This is the weekend before tech week of Zombeo and Juliet. Been a slow day, it has. Yesterday was appliance shopping day. Being a grown up mean sometimes having to go out and buy a new fridge (the old one wasn't working as well and since it came with the house, we are unsure of how old the appliances are). The other major purchase was a washer and dryer . The dryer hasn't worked in 3 years, and since I don't want to have to buy a new washer later on, David and I decided to get a set and a fridge. I feel so grown up. Anyway, onto the progress: I have been working on my poetry pages. I only have publisher right now and I am trying to lay out the poems, but it's guess work. I am not sure if it's going to look nice, or just cheesy. I want to get a better program than publisher, but right now I am trying to re-learn and play with the concept of publisher. What is a go program for page layout, Dear Readers. In some ways I want so artwork, or free slip art/photos (morguefile) to go with the poem. I am trying to something more grown-up looking. I could use some advise on this, if anyone has any tips or suggestions. There is also the 30 days of online journals (from NaPoWriMo) that take poetic and/or prose submissions. Been pulling out some of my recent poetry for this past month and earlier in the year for submissions. I always get a little nervous when I go to submit my poetry. Poetry is a personal form for me and for me to let go of the poems and try them out on the world scares me a bit. But then I think, 'What the heck. I wrote this and some one should read it and enjoy it. I have to try; go out of my comfort zone. Right? So, my goal for Wednesday is to have a cover letter and bio prepared and submit to at least to online journals. I begin tech week for Zombeo and Juliet, so this week is going to be a full one. Since the Tempest, my weeks have been slower and I think my brain, subconsciously wants something to do. Heheheh! No rest for the wicked. I also watched fellow thespians perform a production of Woody Allen's "Play It Again, Sam" and then hung out with friends. Today was a good re-coup/lazy Sunday. It was warm and sunny, and I wished I had gone outside for a hike. A good goal for next Sunday, weather permitting, to go a hike up at Spencer Crest Nature Center. Still reading "Catching Fire", making progress and while chilling at Soulful Cup, the favourite locally owned coffee shop, I got some interesting ideas that I want to include in a story; cow wrangling in the middle of the night, a cow that follows people like a cat/dog, an octopus civilization (watch this video of an Octopus), and post war worlds (in the vein of Logan's Run). Not all in the same story, but that could be a real challenege too. Have a great week, Dear Readers. Go and visit the A Round of Word Blog Hop, go and make something awesome this week, and remember, I believe in you. It is Wednesday, isn't it? A ROW80 Check-in! So, I have made it. The day job has kept me running, mostly with the phone. I swear, I hate the phone in the summer months. Not that I hate my job, I rather love it. Keeps me busy, but damn, the phone, oh the phone! It comes from being an Admin Assistant. You take a lot of the flack and do much of the work. Ah,well...work is good for Woman, make her strong like Bull (that would be the 'classic' line from the very first dinner theatre I performed in back in 2006, "Audition for Murder")!!! Been spending my days working on getting my house back in order. I finally have vaccuumed thoroughly. I still need to either rent or borrow a Rug Doctor steamer machine thingie. The down stairs carpets are a mess, vaccumumed, but I'm sure the colour is not the original colour. Also, trying hard to keep up with the dishes and laundry (the main culprits of messy house syndrome). And, David and I get to be grown ups and buy a new washer/dryer set and most likely a fridge too. Oh, the joys of owing a home! Anywhoo, the writing and updates. I have some. I have taken my Microsoft Publisher and imputed my NaPoWriMo poems into pages, and am now working on designing those said pages. I want a rough draft of a poetry book so I can start submitting it to the various publishers listed during NaPoWriMo. That my goal for this week: to finish a draft of the poetry book and to go through and list the online journal and when they accept submissions. Been a bit dry on the physical writing, but I wanted to spend time visiting fellow ROW80-ers. Back on Sunday, Got to visit about 7. Not bad, I figure, I should try to visit between 5 to 10 blogs from Blog Hop. I got an idea to revisit mysteries and maybe start another short story, using the genre of mystery. I also need to really take note, especially for writing mysteries. Mysteries are generally written backwards. I have my two WIP stories that need attention. Going to try to give both some time this week, probably later in the week. Feeling pretty good, even with the crazy bat shite bonkers week. I am feeling like this means I need to focus more on the writing. The Tempest is over. I have caught up on my sleep. The house is less of a disaster. And the new cat, Cheezit, is starting to settle in (although pictures will follow), mostly, still being a pistol to Lucy Belle. Oh, and I almost forgot. There is the A to Z Road trip. A time to go and visit all of the other bloggers/writers who participated in Blogging From A to Z Challenge (I finally got the FULL name right). 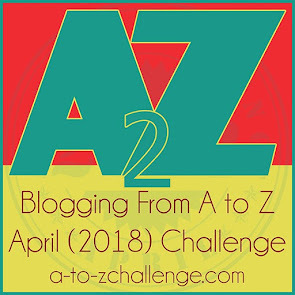 This is will easy, and I can reflect further on the A to Z Challenge, which I already did some reflecting on on my last blog post. Have a great mid-week, Dear Readers! I will see you on the interwebs, Twitter, and the Facebook. I just spent the last month, 26 days, not counting Sundays blogging about letters of the alphabet and things that start with that said letter. It's very free thought, free flowing, with a lot of possibilities. I discovered that sometimes just listing words starting with a certain letter. It lends itself well to stream of consciousness thinking, writing. Also, do A to Z with NaPoWriMo was a challenge, because the daily prompts weren't always easy to sync up the daily letter. Where I knew what I wanted to blogging about with A to Z, I wasn't always able to work into the daily poem prompt. And , I think I ended up just writing them separately, it just worked better. It worked and I had fun. Some days were a heck of a lot easier, W for Whovian, D for Dragon, S for Strax. I did figure out that having a list of items to work from helped in the latter half of the alphabet and sometimes, when my brain wasn't focusing, I had something to work with. Other times, I just went to the dictionary, my actual "New Heritage Dictionary", from college even, and started reading the pages. I actually own a dictionary, even though I do use dictionary.com and thesaurus.com. I own an actual copies of these text. 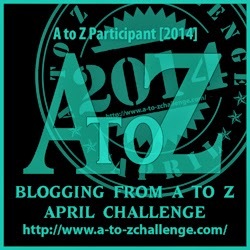 Yes, I will do Blogging From A to Z Challenge again. I was a nice change. Something different. Something new. It stretched my grey matter. What will I do differently? Well, probably do a base list of words for each letter, as a backup. I will also not default to the easiest topic. I will look of different approaches, new words, new concepts. But, Dear Readers, I will keep the stream of consciousness writing style. It really does work. It's more of a brain storming tool, but I can see how with a lack of idea, that the stream of consciousness worked. Sometimes that's when we find something new to try. 1. Skip a day (AT ALL)!!! 2. Reuse topics from the previous year. Anyway, it's been a week since "The Tempest" finished, Improv has started, and two weeks LCP's Junior Player perform "Zombeo and Juliet". I have begun the May feeling a bit worn, but also with determination. I have two potential poetry anthologies to put together and edit (well, I always end up editing my poem, sometimes years after they were written). This weekend I started playing with Microsoft Publisher, putting my NaPoWriMo poem onto pages, making them look nice, and general editing. I want to finally make good on the publishing goal from last Round 1 of ROW80. It's a good day. 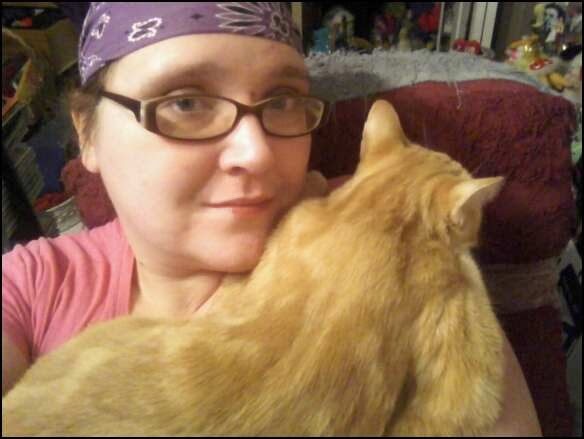 We also, just received a new furr baby, Cheez-it, who is currently exploring the house and getting accustomed to Lucy, and vica versa. 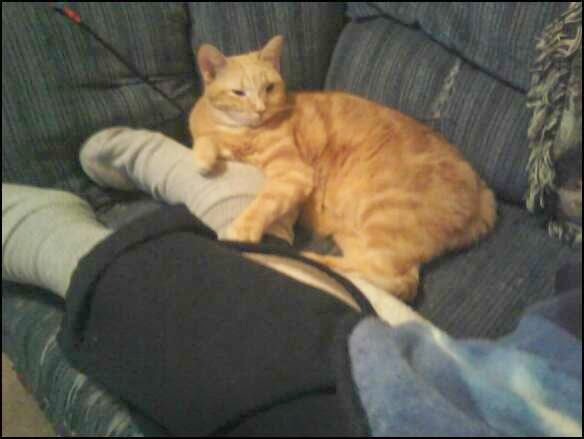 So far, so good, just a little hissing when Lucy gets too close to Cheez for his comfort. It's kinda cute to watch. Glad this is happening on a Sunday. Means time to adjust. Also, been working on general housework, laundry, dishes, and the like. Gonna need more coffee and some additional motivstion today, it's still early though. Maybe I will work on my WIPs later today. Going to enjoy this Sunny, if Breezy Sunday and listen to music, drink coffee and work on my writing stuffs, Dear Readers. Have a fantastic day! Go check out my fellow ROW80 bloggers/writers at the Blog Hop! Also, enjoy some of my choice of music this afternoon.